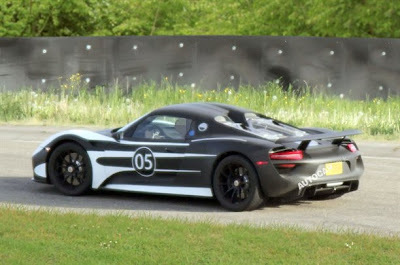 The first fully road legal prototype of Porsche’s upcoming 202mph petrol-electric hybrid powered 918 Spyder has been spied undergoing shakedown tests near Porsche’s Weissach R&D test facility. While it appears similar to the concept, close inspection reveals a number of changes have taken place in the production process. Among them is a smoother looking front end with smaller air ducts out on the front corners and a bonnet that does without the air vent of show car. The windscreen also sits at a more upright angle and the cabin has been extended slightly in length – as evidenced by the prototype’s longer doors. At the rear, there are more prominent hunches over the rear wheels and a longer rear overhang – presumably a requirement to see the new car house its advanced petrol-electric driveline, which is concentrated wholly within the lower half in a move Porsche says is aimed at providing the lowest possible centre of gravity. Also clearly visible on the prototype pictured here is the 918 Spyder’s so-called top pipes – exhausts that exit out of the top of the engine bay just behind the monocoque’s integral carbonfibre roll over hoops.